Please note the writing on the side of the bus. 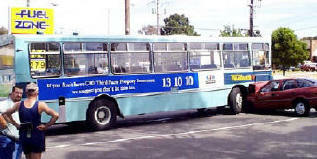 It says: "If you don't have GIO Third Party Property Insurance, we suggest you don't hit this bus." Keep it clean- this is a family website! caption: oucth!!!!! I think i go in a wrong way, SORRY! caption: stop sign?, what stop sign? caption: AND THE BUS WINS!!! caption: ok was the woman driving the bus or car??? caption: Cruising for a Bruising! caption: Puff puff give man your messin up the rotation.....LOOK OUT!!!! caption: wonder who's wife that was!! I knew that insurance policy would come in handy! DOOHHH!!!! I didn't see the word don't. "Better stunt than in those those stupid AFLAC commerials, don't you think?" Man I can't read that small writing... better get a closer look. OH NO, better get GIO! GIO better have a darn good lawyer; I paid my fare, and the was nothing that said I couldn't take my car on the bus.